Islam is often misunderstood not only by non-Muslims, but also by Muslims themselves. This in turn leads to various misunderstandings and falling-outs not only between Muslims and non-Muslims, but also among Muslims themselves. Various approaches have been proposed to improve the situation. One of the most recent ones focuses on reinvigorating the concept of al-wasatiyyah with all its dimensions on account of its centrality in the Islamic message. (Qaradawi, 2010; Wan Norhasniah, 2013) The move is utterly justified, and if properly planned and executed, its eventual impact on a global stage is expected by all. This is so because there is no segment of Islamic culture and civilization that is not influenced, directly or indirectly, by the strength and scope of al-wasatiyyah. The realm of Islamic built environment is no exception, as this paper is going to demonstrate. Because this is mainly a theoretical study based on a non-empirical approach, the methodology adopted is a qualitative one featuring a combination of the descriptive and analytical methods. As a result, the first thing discussed is the concept of al-wasatiyyah as enshrined in the original sources of Islam and the Islamic tradition. Next, three main dimensions of Islamic built environment, where the notion of al-wasatiyyah in that particular context is most evidently manifested, are dwelled on. Those Islamic built environment dimensions represent a direct upshot of Muslims’ comprehension of the same Islamic original sources and their application in time and space. Thus, a number of converging points between al-wasatiyyah and Islamic built environment, both of which originate from the identical heavenly sources, are presented and analyzed. Correspondingly, a brief and comparative overview of some divergent perceptions of Islamic built environment, those which downplay or completely dispense with its al-wasatiyyah disposition, is at the end also given. The term al-wasatiyyah is derived from an Arabic word “wasat” which means middle, fair, just, moderate, milieu and setting. The word in its different forms is used in several contexts in the Qur’an, all the word forms revolving around similar linguistic meanings. Allah says: “Thus, have We made of you an Ummah (Community) justly balanced (wasatan), that ye might be witnesses over the nations, and the Messenger a witness over yourselves…” (al-Baqarah 143). However, the first verse and its messages signify a perspective which is principally used for advancing the nucleus of the al-wasatiyyah (moderation) paradigm. Accordingly, when Allah describes Muslims as “ummatan wasatan” (justly balanced ummah), the impression thus conveyed is that Islam is a religion of peace, moderation and impartiality, not of extremism, prejudice and intolerance. An ummah and its cultures and civilization, which have been established and molded by the vitality of Islam, are to be adorned with the same attributes and traits. Moreover, Islam is a religion of amity, justice, harmony and moderation with the Creator, self, people and at once built and natural environments. These ideals of total balance and equilibrium are to be promulgated and practiced at each and every tier of Muslim existence — including built environment — without compromising on honesty, integrity and truth. Indeed, this dimension of Islam is critical because so long as there is no peace, harmony or justice with God, there could be no peace, harmony or justice with self either. And surely, so long as there is no peace, justice or harmony with God and self, there could be no amity, harmony or fairness with people either, and with the rest of the constituents in the intricate web of creation. In the same vein, according to Mohd Kamal Hassan (http://www.iium.edu.my/irie/11/info/Sample-3.pdf, accessed on June 12, 2013), another implications of the notion of al-wasatiyyah for contemporary Muslim society include balancing between the permanent principles of Islamic law and the changing conditions of the time; the coupling of religious duty with the social reality; engaging in dialogue and coexistence with other people, and practicing tolerance with those who differ; as well as presenting Islam as a balanced, integrated civilizational mission for the revival, liberation and unification of the ummah. In agreement with a divine decree, the Muslim ummah charged with the morals and quintessence of al-wasatiyyah is destined to serve as a role model to other nations and communities, confidently leading and guiding them through life’s challenges, trials and mysteries. This is so on account of an established historical truth that all man-generated life systems, ideologies and “solutions” in the absence of legitimate revealed truth and direction gradually fade away as soon as they come to civilization’s fore, except the revelation inspired and guided life system, ideology and “solution” of Islam. The justly balanced Muslim ummah, characterized as truthful, altruistic, cultured and sophisticated, is thus to serve as a witness over others, to selflessly intervene in the cause of peace and justice and to function as mankind’s ultimate source of optimism, luminosity and hope. Hence, following the pronouncement in the first of the five above-quoted Qur’anic verses that Muslims are “ummatan wasatan” (justly balanced ummah), Allah proclaims next that such is the case so “that ye might be witnesses over the nations”. Furthermore, the subsequent Allah’s words in the same verse: “and the Messenger a witness over yourselves”, emphatically implies that to Muslims in their whole al-wasatiyyah enterprise, Prophet Muhammad (pbuh) and the revealed Word constitute the supreme point of reference as well as the infinite sources of inspiration, zeal and legitimacy. Were it not for the Prophet (pbuh) and the revealed guidance, Muslims and their civilizational representation would have been stripped of their intrinsic perpetual potency, light, honor and purity. Theirs and their civilization’s fate would eventually have become similar to the fates of the rest of mankind’s ephemeral civilizational endeavors and experiments. It follows that what Muslims are expected to be to others in the physical world, that is what the Prophet (pbuh) is to them in both the physical and metaphysical worlds. Islam is a universal religion (al-Hujurat 13; Saba’ 28; al-An’am 38); so is the built environment of its peoples, because Islamic built environment functions as a framework for their Islamic lifestyles. Indeed, universal, righteous and justly balanced is every segment of Islamic eclectic civilization of which Islamic built environment is an integral part. Moreover, the relationship between al-wasatiyyah – as an overarching quality of the Islamic message within whose orb such fundamental Islamic notions as justice, excellence, goodness, balance and moderation reside and operate – and Islamic built environment is very solid and reciprocal. The reason for that is the verity that while al-wasatiyyah signifies both a comprehensive and complete Muslim thought and lifestyle, Islamic built environment, on the other hand, exists in order to enclose, or frame, and to facilitate and promote such a lifestyle. The philosophical dimension of Islamic built environment, furthermore, runs parallel to and eventually absorbs the thrusts of virtually all qualities and aspects of al-wasatiyyah. At the core of each of Islam, Islamic built environment and al-wasatiyyah, therefore, stand such concepts as One God, the finality of the religion of Islam and Muhammad’s prophethood, the equality and unity of mankind, moderation and even inclusivism (al-Baqarah 143; al-Anbiya’ 92; al-Ahzab 40; al-Nahl 90). Being what it is, once revealed to Prophet Muhammad (pbuh) the principal and most immediate concern of Islam was not building pursuits as such. (Al-Samahudi, 1997) Islam felt that the most pressing issue was to correct people’s perception of life, the world, nature, civilization and man: his role and position on earth, for if these are perverted, people’s perception of and approach to building would be perverted and corrupted as well. Similarly, if these issues are properly grasped and honored, people’s perception of and approach to building would be apt and inspired as well. For this reason, for example, does the Qur’an speak not only about faith but also about building and development when referring to some of the ancient civilizations, such as that of the ‘Ad, Thamud, Pharaohs and the children of Israel. The Qur’an thus wishes to explicate some of the detriments that human society is bound to put up with on the physical plane of civilization as soon as the divinely prescribed worldview is forsaken and other alternatives become sought instead. The message meant to be thus communicated is that the major and most urgent task of the followers of Islam is to strive to understand, accept as true, apply and further advance the message of Islam by all the rightful means. However, as for the building systems, styles and techniques that they meanwhile may evolve, as part of life’s essential affairs, it at the end of the day does not matter what they shall be as long as they stem from the body of Islamic teachings and norms, conform to the tawhidic worldview, and are subjected to the realization of the objectives that man is asked to accomplish on earth. By the same token, it does not matter whether such systems, styles and techniques are developed solely by Muslims or, after having been duly refined and corrected, are totally or partly imported from other cultures and civilizations. In other words, Muslims are advised to attend to the root cause, which is the actualization and translation of the word of God on life, which will gradually but inevitably lead to a desired goal, which is the creation of Islamic civilization with all its segments including Islamic built environment, for the latter is both the ground and container for the former’s realization. At any rate, the whole exercise must be seen as aiming as much at the enriching and enhancing of the building technology and expertise of Muslims as at the constituting and intensifying of the all-inclusive Islamization process which Muslims had embarked on since the earliest days of revelation. Just like the religion of Islam, Islamic built environment is not confined to an ethnic group, historic episode or a geographical region. It is not governed by a restricted perception or an outlook, nor is it locked up in a style and a set of rigid methods and techniques. Islamic built environment is open to all people to enrich and enhance it through their various styles, methods and techniques and to enjoy its many benefits. Islamic built environment is a global phenomenon with an outlook that not only makes use of but also transcends the experiences and ideas of this world. It is a phenomenon with a universal appeal and meaning. It is a product of an interplay between the absolute or permanent and the relative or temporary realities, i.e., between the Islamic beliefs that give Islamic built environment its quintessence and those corporeal elements that give it its form. Islamic built environment is a symbiosis between a global religion and life in its totality. It is a union between the material and spiritual spheres, and between the heavens and the earth. Islamic built environment cherishes its perpetual heavenly spirit and identity never compromising them. At the same time, however, it is ever ready to welcome any contribution by anyone, even non-Muslims, so that the former is made even more conspicuous and its impact further enhanced. That is why while spreading Islam to the world, Muslims never hesitated to avail themselves of the existing types of built environment. The only thing that needed their most immediate attention and so correction were those aspects of architecture that were closely associated with faithlessness and idol worship. With the processes of Islamizing people’s minds, attitudes and systems of living, another process, that of Islamizing architecture, went concurrently on, albeit with less dynamism and less dramatic effects as the former. This was so because once the former in its capacity as a cause took place, the latter in its capacity as an effect spontaneously came about. In so doing, the existing indigenous building styles, technologies and engineering were not only fully respected but also adopted as the best way for conducting building activities now under the aegis of Islam and Muslims. As a result, local building materials, expertise and draftsmen were widely employed. It is true that in terms of built environment Muslims were by far inferior to their Persian and Byzantine counterparts in the newly acquired territories. However, to compete with and eventually overshadow them in that regard was not on the list of the immediate priorities of Muslims. What was on the list was how to conquer the people’s hearts with the new Islamic spirit which, in turn, will trigger subjecting the existing built environment to the new living paradigm. Once injected with the new life-force, the same built environment was bound to be elevated to new levels starting from where it already was. And that is exactly what soon came to pass. Other people’s indigenous architectural legacies, once purified if such was necessary, were seen as an asset and not a liability, as a help and not an obstruction. They were used as a vehicle for expressing Islamic built environment. Hence, apart from identifying the genuine built environment of Muslims as “Islamic”, it is also appropriate to add an indication of a geographical region or an ethnic group that added an extra flavor to what Islamic built environment actually is. Hence, it can rightly be said “Islamic Umayyad built environment”, “Islamic Abbasid built environment”, “Islamic Turkish built environment”, “Islamic Iranian built environment”, “Islamic Malay built environment”, etc. In this type of appellation, the notion of universalism in Islamic built environment is not meant to be downgraded or violated. On the contrary, however, it is duly acknowledged and highlighted. The Islamic ideas of moderation, justice and unity in diversity are clearly spelled out too. No architectural expression that is firstly indigenous and secondly Islamic. Islam is Islamic built environment’s soul. Indigenous components can have no more than some bearing on shaping the form of Islamic built environment, whereas its essence remains forever the same. Even though limited, the influence of indigenous components in Islamic built environment is still overseen by and is fully submissive to the Islamic ideology. Islamic built environment is a type of built environment whose functions and to a lesser extent form are inspired primarily by Islam. Islamic built environment is a framework for the implementation of Islam. It facilitates, fosters and stimulates the ‘ibadah (worship) activities of Muslims, which, in turn, account for every moment of their earthly lives. Islamic built environment only can come into existence under the aegis of the Islamic perceptions of God, man, nature, life, death and the Hereafter. Thus, Islamic built environment would be the facilities and, at the same time, a physical locus of the actualization of the Islamic message. Practically, Islamic built environment represents the religion of Islam that has been translated onto reality at the hands of Muslims. It also represents the identity of Islamic justly balanced culture and civilization. Ibn Abdun, an Andalusian judge from the 12th century, is reported to have said, as quoted by Stefano Bianca (2000): “As far as architecture is concerned, it is the haven where man’s spirit, soul and body find refuge and shelter.” In other words, built environment is a container of people’s lives. Also, Ibn Qutayba, a Muslim scholar of the 9th century, compared the house, as quoted by Afif Bahnassi (http://www.isesco.org.ma/pub/Eng/Islarch/P2.htm, accessed on June 12, 2013), to a shirt, saying that just as the shirt should fit its owner, the house too should suit its dwellers. That is to say, the aesthetic and utilitarian ends of the house must correspond to the needs and capabilities of its users. The two must perfectly suit each other. Central to Islamic built environment is function with all of its dimensions: corporeal, cerebral and spiritual. The form divorced from function is inconsequential. This, however, by no means implies that the form plays no role in Islamic built environment. It does play a prominent role, but its relevance is a supportive one supplementing and enhancing function. The form is important, but in terms of value and substance it always comes second to function and its wide scope. There must exist the closest and subtly balanced relationship between the ideals that underpin the form of buildings and the ideals that underpin their function, with which the users of buildings must be at ease. A rift, or a conflict, between the two is bound to lead to a conflict of some far-reaching psychological proportions in the users of buildings. This way, the roles of the form become equivalent to the roles of function. Islamic built environment means a process that starts from making an intention, continues with the planning, designing and building stages and ends with achieving the net results and how people make use of and benefit from them. Islamic built environment is a fine blend of all these stages which are interlaced with the tread of the same Islamic worldview and Islamic value system. It is almost impossible to single out a tier in the process and regard it more important than the rest. It is because of this conspicuous spiritual character of Islamic built environment, coupled with its both educational and societal roles, that the scholars of Islam never shied away from keenly addressing a number of issues pertaining to various dimensions of residential, mosque and communal architecture within the scope of Islamic jurisprudence (fiqh islami). (Al-Hathloul, 2002; Hakim, 1988) The relevant issues are discussed under different headings such as: legal rulings in connection with neighbours and neighbourhoods (ahkam al-jiwar), reconciliation (al-sulh) between immediate neighbours and all the people in a neighbourhood, people’s individual and collective rights, prohibition of inflicting harm (darar), legal rulings pertaining to building (ahkam al-bina’), and public services and facilities (al-marafiq). All these issues undoubtedly play a significant role in shaping the identity of Islamic built environment. They are either directly or indirectly related to conceiving, designing, forming and using Islamic built environment. Since architecture is people’s art greatly influencing their moods and the day-to-day life engagements, the same issues concerning architecture are studied as part of exhaustive encyclopaedic works on Islamic jurisprudence (fiqh islami). Islamic built environment accepts no rigidity, formalism and literal symbolism, especially in relation to its structural domains. What makes a built environment Islamic are some invisible aspects of buildings, which may or may not completely translate themselves onto the physical plane of built environment. (Bianca, 2000; Akbar, 1988) The substance of Islamic built environment is always the same, due to the permanence of the philosophy and cosmic values that gave rise to it. What changes are the ways and means with which people internalize and put into operation such philosophy and values to their own natural and man-generated circumstances. Such changes or developments could simply be regarded as most practical “solutions” to the challenges people face. Islamic built environment thus promotes unity in diversity, that is, the unity of message and purpose, and the diversity of styles, methods and solutions. (Al-Faruqi, 1985; Al-Hathloul, 1996) The identity and vocabulary of Islamic built environment evolved as a means for the fulfilment of the concerns of Muslim societies. Islamic built environment was never an end in itself. It was the container of Islamic culture and civilization reflecting the cultural identity and the level of the creative and aesthetic consciousness of Muslims. Built environment, in general, should always be in service to people. It is never to be the other way round, that is to say that architecture should evolve into a hobby or an adventure in the process imposing itself on society while forsaking, or taking lightly, people’s identities, cultures and the demands of their daily struggles. Built environment, first and foremost, should remain associated with functionality. It should not deviate from its authentic character and stray into the world of excessive invention and abstraction. Building is but one of the noble means by which the noblest goals are attained; it is an instrument, a carrier of the spiritual, not a goal itself. People are not to build more than what they really need for the reason that every building activity will be harmful to its executor on the Day of Judgment, unless carried out due to a real necessity, i.e. to meet a need, as proclaimed by the Prophet (pbuh). (Sunan Abi Dawud, tradition No. 4559) The Prophet (pbuh) announced this on seeing a dome imposingly surmounting a house in Madinah. The Prophet (pbuh) is also reported to have said that the most unprofitable thing that eats up the wealth of a believer is building. How true, especially if the benefits, both material and spiritual, of erected buildings are not maximized! One’s wealth constitutes a major portion of what one has been assigned of this fleeting world, which is to be meticulously managed for the benefits of both worlds. Both wealth and built environment are to be perceived only as means; neither one represents an end in itself. If one possesses a positive perception about wealth and the notion of creating buildings, which, in fact, reflects one’s positive total worldview, one is then able to recognize that whatever wealth he has been granted is sufficient for him. He will, furthermore, easily understand how much and what type of built environment he needs so that the execution of his divinely inspired life engagements is supported and facilitated. Hence, a believer will always be content with unassuming buildings, above all if they are private ones, thus allowing him to make use of his wealth for some other wholesome purposes, both personal and communal. This way, restraining tendencies towards the crimes of wastefulness, greed, jealousy, ill feeling, haughtiness, and so forth, in a person will become a much easier proposition. It goes without saying, therefore, that the biggest fault, as well loss, is that one exhausts all the resources and amenities that God has bestowed upon him for the momentary joy and pleasures of this world, while procuring nothing, or very little, for the Hereafter. Definitely, true believers are immune to this agonizing scenario. Against the background of these damaging vices often committed in the field of building – sometimes unconsciously and under the influence of popular and widespread dissolute trends, though – must we view every tradition of the Prophet (pbuh), as well as the sayings and practices of his nearest companions, wherein some aspects of building are at a first glance denounced. The Qur’an often refers to ‘Ad, the people of the prophet Hud, in order to teach us some valuable lessons regarding building, in particular, and dealing with this world, in general. ‘Ad are said to have been materialists feeling quite secure in their fortresses and resources, and believing but in brute force when dealing with those who came within their power. They were accused, among other things, of excessively priding themselves on show and parade, building palatial monuments on every high place in order to amuse themselves and impel others to hold them and their material prosperity in awe and utmost respect, (al-Shu’ara’ 123-140). When the prophet Hud came to them with Allah’s message and clear signs, they ridiculed and rebuffed them, so God destroyed them by a furious wind, exceedingly violent. Nevertheless, before rivalry in building, coupled with other grave transgressions, becomes a lucid sign of the Day of Judgment’s proximity, the same vice will represent one of the root causes of disunity, decadence and intellectual impotence of the Muslims, exactly as their Lord has cautioned them against: “And obey Allah and His Messenger; and fall into no disputes, lest ye lose heart and your power depart; and be patient and persevering: for Allah is with those who patiently persevere.” (al-Anfal 46). Lastly, protecting and peacefully coexisting with the natural environment while creating a built environment is paramount in Islam. Inflicting harm on the environment is a sin whose severity corresponds to the harm caused. So significant is man’s relationship with the environment in Islam that in some instances such a relationship can take precedence over other deeds of man, placing him then on the highest or dragging him to the lowest. This is so because according to Islam, man is a vicegerent on earth, or steward, or manager of creation. The environment is part of God’s creation too. Its role is two-fold: to worship its Creator (in ways suitable to it) and to be of service to man, so that man can smoothly and undeterred carry out his honorable task of vicegerency. The essence of the implications of the concept of al-wasatiyyah for Islamic built environment could be summarized in the words of Prophet Muhammad (pbuh) that there should be neither inflicting nor returning of harm (la darar wa la dirar) (Sunan Ibn Majah, tradition No. 2331), as well as in the words of the Qur’an that, apart from the physical foundations, buildings ought to be established on the metaphysical foundations of piety (al-taqwa) and God’s good pleasure (al-ridwan) as well (al-Tawbah 109). Indeed, it was due to this that Koca Mimar Sinan (2006), the chief architect of the Ottoman golden age, called architecture an “estimable calling” and then said that whosoever wanted to practice it correctly must be, first of all, righteous and pious. Thus, the unity of Islamic architecture and the whole orb of Islamic built environment, and their harmony within themselves and with their surroundings and users, signify to Isma’il al-Faruqi (1981) a facet of unity of the Muslim community (ummah) under Islam. “It did not exist before Islam, when architectural styles differed widely. It came to exist with Islam, when Islamic characteristics began to dominate the architectural styles of Muslims, allowing a number of variants on non-essential matters to accommodate indigenous climatic or inherited features” (al-Faruqi, 1981). Prophet Muhammad (pbuh) as well as many subsequent Muslim communities throughout the long and colorful history of Islam and its peoples have in practical terms demonstrated the strong relationship between al-wasatiyyah and Islamic built environment. Both history and the numerous residues of the Muslim built environment legacies, still dotting a great many territories of the Muslim world, are witnesses to this truth. However, following the gradual weakening and ultimate collapse of Islamic civilization, the truth in question was repeatedly distorted at the hands of many people and for various reasons. Therefore, for example, Islamic built environment was repeatedly seen by many scholars, Muslims and non-Muslims alike, as one concerned primarily about its functionality at the expense of its form (Grube, 1987; al-Faruqi, 1970). Its symbolic importance, too, has been often exaggerated at the expense of its actual roles and purpose (Dickie, 1987; Ardalan & Bakhtiar, 1973; Nasr, 1987; Burckhardt, 1976). Similarly, too much emphasis on the notions of the sheer form of Islamic built environment, the evolution of its physical vocabulary in relation to the built environments of other cultures and civilizations, as well as the many other implications of the time and space factors, overshadowed greatly the spiritual, universal and pragmatic character of Islamic built environment (Creswell, 1989; Hillenbrand, 1994; Grabar, 1987). In the same vein, furthermore, Islamic built environment is at times viewed and appreciated through the prism of imperial institutional buildings only, such as royal palaces, mosques, mausoleums and gardens. Scores of such structures accounted for mere icons and monuments, and so, the spiritual authenticity of some of them, especially in the case of massive tombs and memorials, is repeatedly questioned. In the process of venerating those structures, the significance of many remarkable communal buildings, public facilities and amenities, as well as private houses, comprising the greater part of genuine Islamic built environment built and utilized by a majority of people, is relegated to the second tier of architectural importance. There is a close and long-term symbiosis between a range of direct and indirect meanings and values entailed in the concept of al-wasatiyyah and the meanings and values which Islamic built environment represents and stands for. Due to that relationship — partly — Islamic built environment is universal, all-inclusive, flexible, unrestricted and fluid. It is not concerned about the form or the artistic dimension of buildings only. Islamic built environment signifies a process where all the phases and aspects are equally important. It is almost impossible to identify a phase or an aspect in that process and consider it more important than the others. The Islamic built environment process starts with having a proper understanding and vision which leads to making a right intention. It continues with the planning, designing and building stages, and ends with attaining the net results and how people make use of and benefit from them. Islamic built environment is a fine blend of all these factors which are interwoven with the treads of the belief system, principles, teachings and values of Islam. It goes without saying, therefore, that without Islam there can be no Islamic built environment. Likewise, without true Muslims who in their thoughts, actions and words epitomize the total message of Islam, there can be no Islamic built environment either. Islamic built environment is a framework for the implementation of Islam, a framework which exists in order to facilitate, encourage and promote such an implementation. Hence, no properly perceiving, creating, comprehending, studying or even using Islamic built environment can be possible in isolation from the total framework of Islam: its comprehensive worldview, ethos, doctrines, laws, practices, genesis and history. Any attempt or method that defies this rational principle is bound to end up in a failure generating in the process sets of errors and misconceptions. Indeed, the existing studies on Islamic built environment, by Muslim and non-Muslim scholars alike, and the ways in which Islamic built environment is taught and practiced today, are the best testimony to the confusion that surrounds the theme of Islamic built environment, as both a concept and sensory reality. Prior to the colonization era, Islamic built environment was an integral and spontaneous segment of the Islamic reality, just like any other cultural and civilizational aspect of Islam as an all-inclusive divine inspiration and guidance. People did not even bother to call it as such (raging debates as to the meaning of “Islamic” and “Muslim” built environment and their similarities and differences, denote a novel phenomenon. Islamic built environment, or the ways people perceived, planned, designed, built and used buildings, was regarded as an indispensable part of an Islamic lifestyle that the Islamic perceptions of life and its myriad conceptual and sensory realities have been shaping for centuries. Truly, Islamic ways of designing and making buildings were seen as that lifestyle itself which in art, planning and architecture took on some of the most expressive forms. The world of Islamic built environment was both the solemn identity and testimony of Islam and the true record of the life of Muslims and their civilizational awareness and achievements. However, following the painful colonization era and its equally painful aftermath, Islamic built environment, just like a majority of the components of Islamic culture and civilization, was both distorted and virtually lost. Now when the Muslims are increasingly experiencing an Islamization awakening, the topic of Islamic built environment is being gradually resurrected too. Although the process is very sluggish, there are many signs on the horizon that inspire, encourage and breed confidence. Reviving Islamic built environment is an extremely serious and demanding task. It requires major contributions and high-spirited concerted efforts of many parties from across the wide spectrum of society: government, educators, practitioners, professional bodies, NGOs, members of the business community, students and the general public. Certainly, relevant governmental departments, colleges and universities, private built environment firms and institutions are identified as the most relevant agencies and their people as the most important protagonists in spearheading and managing the Islamization of built environment project. The responsibilities of these parties are the biggest on account of their roles in society. It follows that in case of failure, especially if such happens due to deliberate mediocrity, lack of interest and apathy, their share of blame will be the biggest one as well. Finally, it is observable that today the concept of al-wasatiyyah is being more and more resurrected and propagated as an answer to many Muslim contemporary cultural and civilizational conundrums. Indeed, since the two: al-wasatiyyah and the identity of Islamic built environment, have much in common, and since they exert a considerable influence on each other’s ultimate actualization — regardless of which one is the cause and which one the effect – the two should be brought much closer to each other in reviving, liberating and unifying the Muslim community. That was always the case in the past when the identity of Islamic built environment was evolving and was sustained, and so has got to be the case today in every forthcoming foremost, inclusive and earnest Muslim revivification enterprise. Abd al-Hamid. (1997). Exploring the Islamic Environmental Ethics. Inside: Islam and the Environmen. Edited by A. R. Aqwan. New Delhi: Institute of Objective Study. pp. 39-69. Ahmad b. Hanbal. (2008). Musnad. Beirut: Dar al-Kutub al-‘Ilmiyyah. Ardalan, Nader & Bakhtiar, Laleh. (1973). 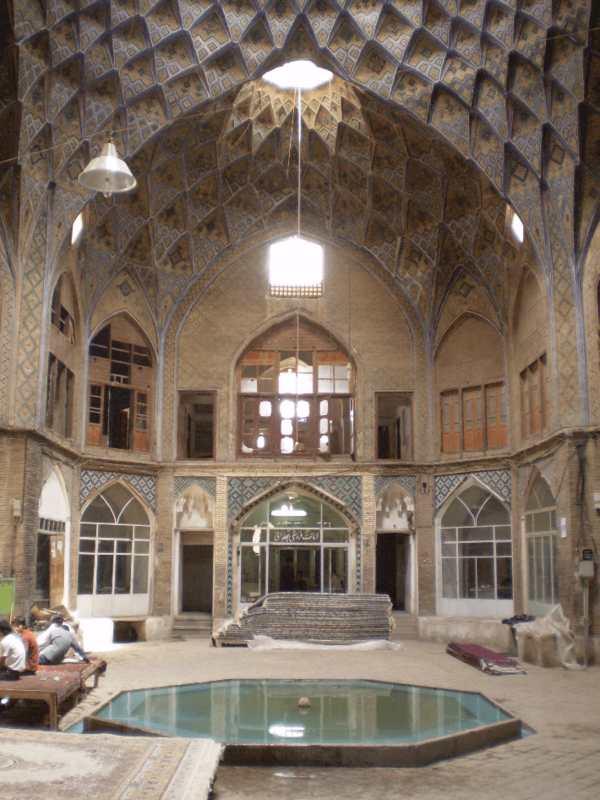 The Sense of Unity: The Sufi Tradition in Persian Architectute. Chicago: University of Chicago Press. Bahnassi, Afif. The Islamic Architecture and its Specificities in Teaching Curricula. http://www.isesco.org.ma/pub/Eng/Islarch/P2.htm, accessed on June 12, 2013. Bahnassi, Afif. (1991). Al-Imarah al-‘Arabiyyah, al-Jamaliyyah wa al-Wahdah wa al-Tanawwu’. Rabat: Al-Majlis al-Qawmi li al-Thaqafah al-‘Arabiyyah. Bianca, Stefano. (2000). Urban Form in the Arab World. London; New York: Thames and Hudson. Al-Bukhari. (2012). Sahih. Beirut: Dar al-Nawadir. Creswell, K. A. C. (1989). A Short Account of Early Muslim Architecture. Cairo: The American University in Cairo Press. Dickie, James. (1987). Allah and Eternity: Mosques, Madrasas and Tombs. Inside: Architecture of the Islamic World. Edited by George Michell. London: Thames and Hudson. pp. 15-47. Al-Faruqi, Isma’il Raji. (1995). Al-Tawhid: its Implications for Thought and Life. Herndon: International Institute of Islamic Thought. Al-Faruqi, Isma’il. (1981). Islam and Architecture. Inside: Fine Arts in Islamic Civilization. Edited by M.A.J. Beg. Kuala Lumpur: The University of Malaya Press. pp. 99-117. Al-Faruqi, Isma’il. (1970). Misconceptions of the Nature of Islamic Art. Inside: Journal of Islam and the Modern age. Vol. 1 No. 1 May 1970. New Delhi: Jamia Nagar. pp. 29-48. Fine Arts in Islamic Civilization. (1981). M.A.J Beg (Ed.). Kuala Lumpur: The University of Malaya Press. Grabar, Oleg. (1987). The Formation of Islamic Art. New Haven: Yale University Press. Grube, Ernst J. (1987). What is Islamic Architecture? Inside: Architecture of the Islamic World. Edited by George Michell. London: Thames and Hudson. pp. 10-14. Hakim, Besim Selim. (1988). Arabic-Islamic Cities. London: Kegan Paul International. Hassan, Mohd Kamal. The Concept of al-Wasatiyyah and the Challenge of Islam Liberal in Indonesia. http://www.iium.edu.my/irie/11/info/Sample-3.pdf, accessed on June 12, 2013. Al-Hathloul, Saleh. (2002). Legislation and the Built Environment in the Arab-Muslim City. http://www.csbe.org/e_publications/arab-muslim_city/index.htm, accessed on June 25, 2013. Ibn Kathir. (1985). Al-Bidayah wa al-Nihayah. Vol. 5. Beirut: Dar al-Kutub al-‘Ilmiyyah. Ibn Majah. (2011). Sunan. Cairo: Dar Ibn al-Jawzi. Omer, Spahic. (2009). 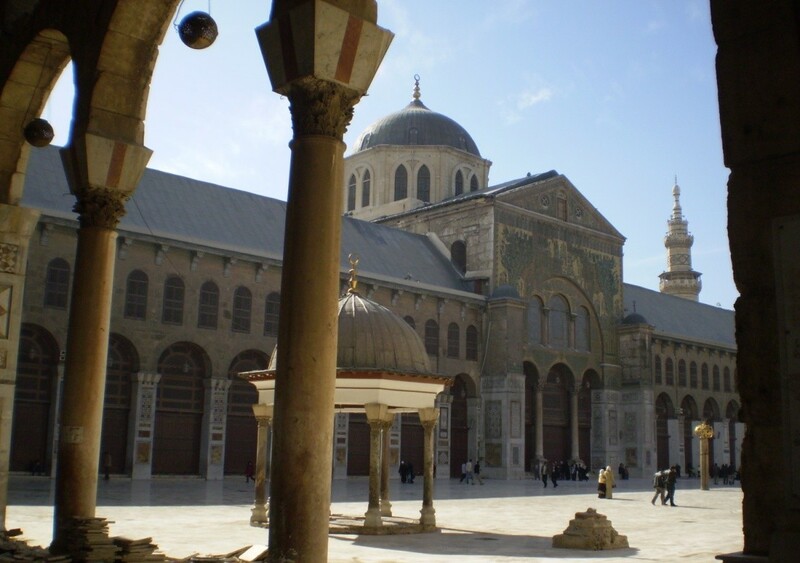 Islamic Architecture: Its Philosophy, Spiritual Significance and Some Early Developments. 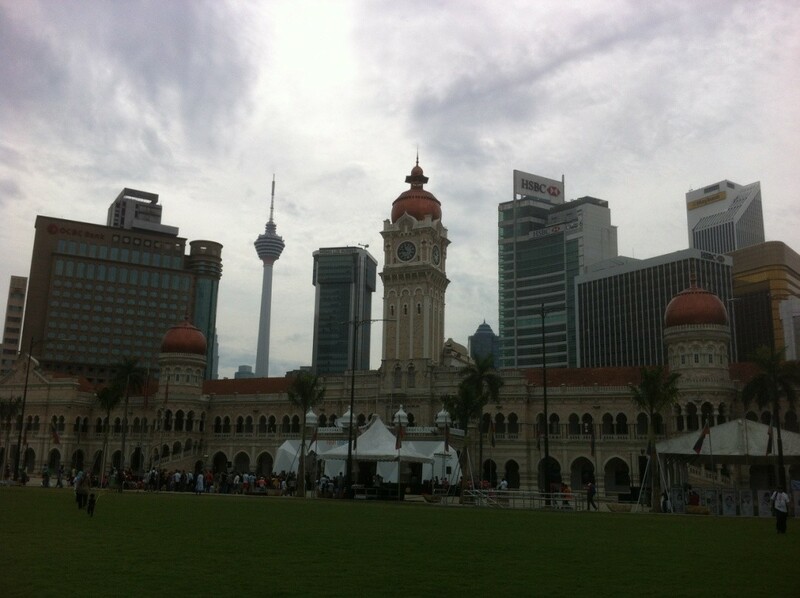 Kuala Lumpur: A.S. Noordeen. Qaradawi, Yusuf. (2010). Islamic Awakening between Rejection and Extremism. Kuala Lumpur: Islamic Book Trust. Qaradawi, Yusuf. The 30 Principles of Moderate and Balanced Thought. Translated by Yasir Fikry Fahmy. http://www.suhaibwebb.com/islam-studies/the-30-principles-of-wasatiyyah/, accessed on June 12, 2013. Al-Samahudi. (1997). Wafa’ al-Wafa. Vol. 1. Beirut: Dar Ihya’ al-Turath al-‘Arabi. Al-Tabari, Ibn Jarir. (1977). Tarikh al-Rusul wa al-Muluk. Vol. 4. Cairo: Dar al-Ma’arif. Al-Tirmidhi. (2010). Sunan. Beirut: Dar al-Risalah al-‘Alamiyyah. Wan Norhasniah, Wan Husin. (2013). The Relationship between the Concept of Wasatiyyah and the Values of Budi-Islam in Reinforcing Ethnic Relations in Malaysia. International Journal of Social Science and Humanity. Vol. 3 (6): 528-531. 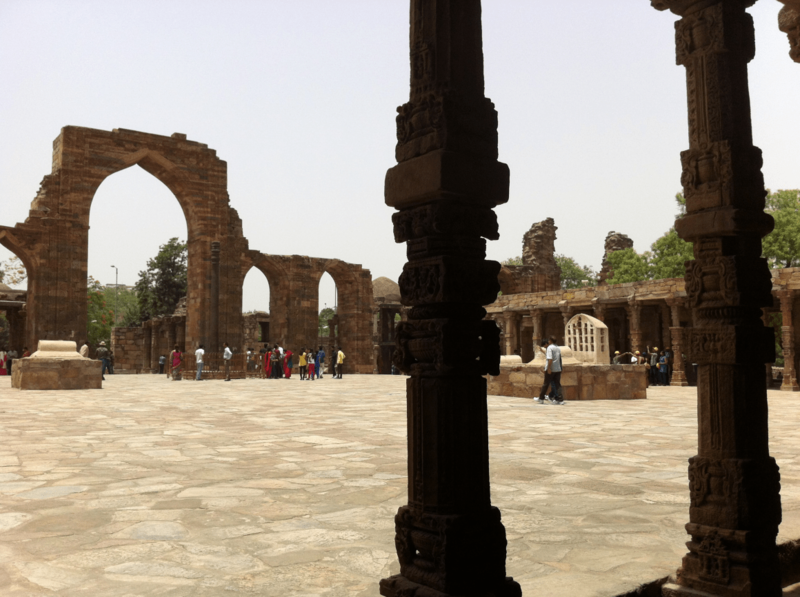 Remains of Quwwat al-Islam Mosque in New Delhi, India. Materials from 27 Hindu and Jain temples, which were mainly abandoned or unutilized, were used for constructing the Mosque. Traditional Malay houses are an excellent example of sustainable, simple-yet-refined and “moderate” Islamic built environment. 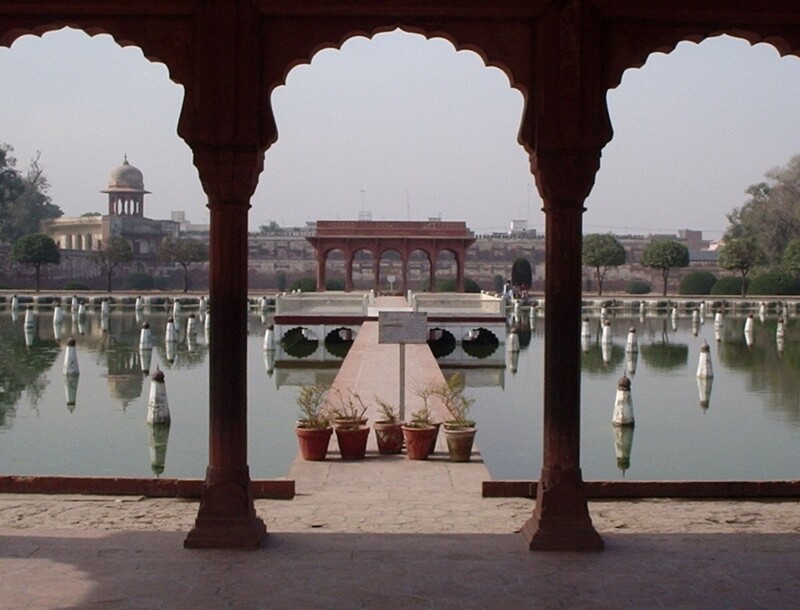 Shalimar Gardens in Lahore, Pakistan. Richly decorated buildings in Sana’a, Yemen. 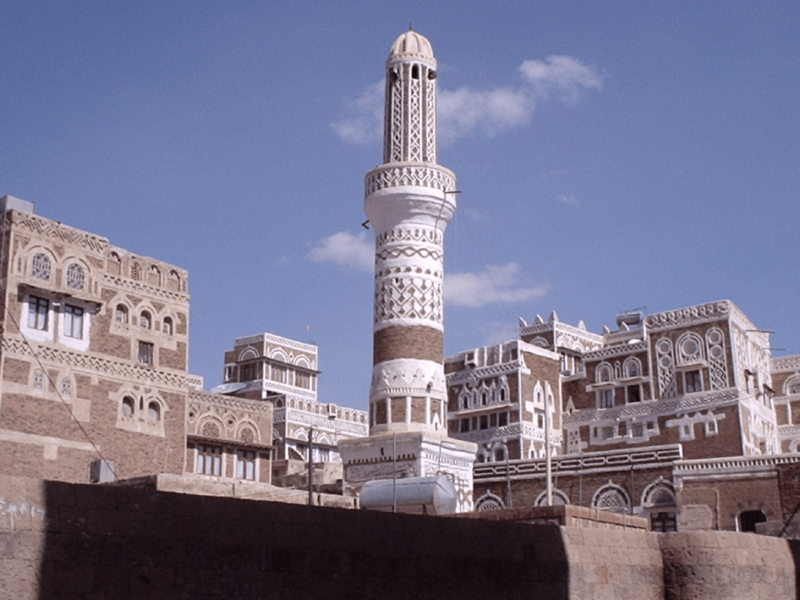 In terms of decoration, virtually all buildings in much of Yemen: private or public, religious or worldly, receive the same treatment, with minor contextual and typological variations. The interior of a caravanserai in Kashan, Iran. A number of social, economic, environmental and religious requirements have been answered by the form and function of the building. 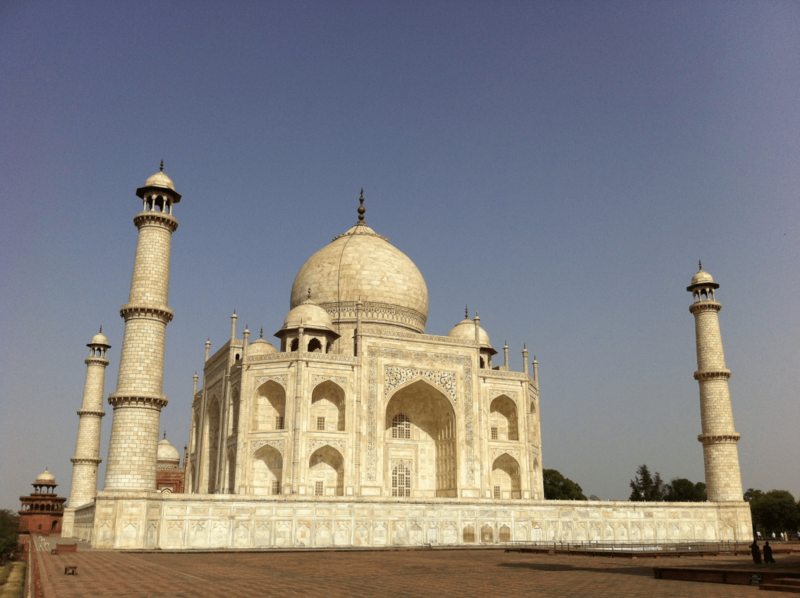 The Taj Mahal in Agra, India, is regarded as one of the best gifts of Islamic art and architecture to the world. However, the building is just a mausoleum and memorial, extravagantly built. As such, it stands at odds with some fundamental teachings and values of Islam. 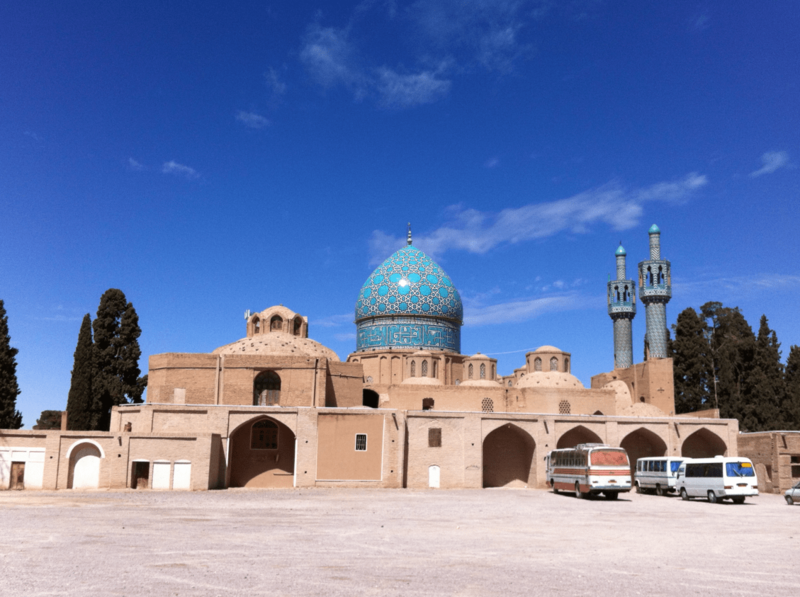 The Shah Ni’matullah Wali funerary and Sufi complex in Mahan, Iran. Shah Ni’matullah Wali (d. 835 AH /1431 CE) was a Sufi master. A Sufi order called Ni’matullahi considers him its founder. Apart from the Shah Ni’matullah Wali shrine and a mosque, the complex also contains a cilehane (Sufi withdrawal and meditation place). The shrine for long served as a pilgrimage site. Architectural conflicts, or incompatibilities, between yesterday and today are evident virtually everywhere in the Muslim world. 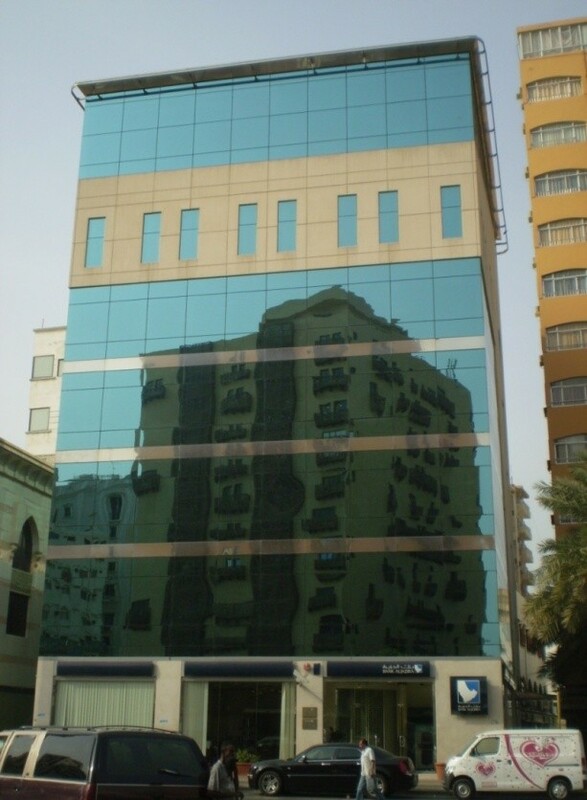 An apartment building with several “traditional” elements and features reflected on the glass façade of a nearby “modern” commercial building in Jeddah, Saudi Arabia. The best solution for Islamic built environment is to be traditional, but without just blindly imitating and repeating the past, and modern, albeit without rejecting tradition and constantly seeking to break with the past. Tradition and modernity in Islamic built environment must be at peace, rather than at loggerheads, with each other. Traditional and modern architecture in Kuala Lumpur, Malaysia. Im looking for a complete journal of this topic for my assignment. Really appreacite for kind help.